The story of Cecily Daye and the sevens continues in The Barren Way as the girls face greater conflicts when their destinies begin to be revealed. The bond that kept them alive will falter under the weight of new alliances. But when the earth beneath them begins to die, allies and enemies face the same extinction and the same question: What is the point of winning if no one is left alive in the end? Stephanie curled into the tightest ball she could and wept, knowing her tears would soon dry and her life would continue, but that the bride toward home had been burned forever. "You can stay if you want - do what they tell you - but I'm getting out of here even if I don't survive. Better to die than surrender before even standing up." Julie is by far my favorite indie author. Her writing is beautiful, her narratives strong, and her characters realistic. In The Downs, she turned these characters lives upside down - more than she already had in the end of The Wild Wood. During The Barren Way, things get more hectic with exposed secrets and unknown identities revealed. I found this book to be a bit heartbreaking because while The Sevens became a unit of one while still holding on to their own identities, they are slowly being torn in different directions. As the novel goes on, the sisters begin to understand that maybe they're not destined to stick together. Each girl has her own destiny and while some sister's destinies may be intertwined, others are completely on their own. There is a lot of character development within this third novel and even the weakest of The Sevens begins to realize her potential and become stronger. However, there are a lot of characters and Julie keeps adding more. While I was able to keep up with the multiple story lines in The Downs, I find myself struggling to remember who is who and what was going on in their story line when we last left them. The nice thing about the multiple story lines, is that by the end of The Barren Way, I have a feeling that all these story lines are going to eventually converge into one. Slowly but surely, they are becoming interconnected and we realize that there is something important about these stories. There is something that is connecting the magical world with the human world. Although The Barren Way felt like it went off in different direction that it's two predecessors, I still enjoyed it. 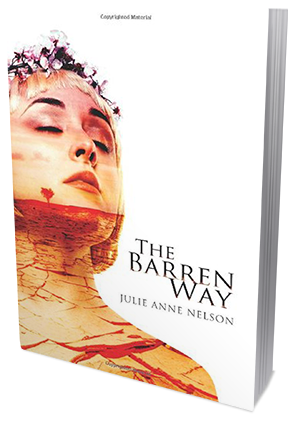 Julie takes her readers on a wild ride full of twists, turns, and jaw dropping revelations. The story and characters have come a long way since book one and I cannot wait to see where Julie takes her characters, and us, next!